Guardians of The Galaxy "Pun Intended"! First Announced at E3 2005 under the title Starfox DS Starfox Command was well received on the show floor. 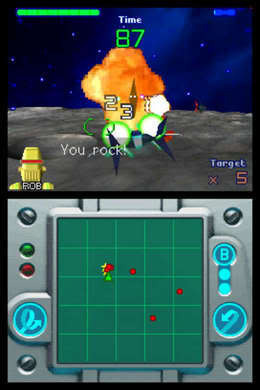 Taking advantage of the then new Nintendo Wi-Fi Connection; Command has the distinction of being both the first handheld and Online playable Starfox Title. 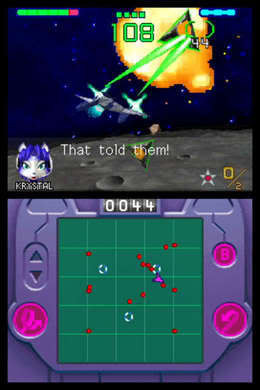 Starfox Command was developed by Q-games and published by Nintendo. Since it was one of Nintendo's popular 1st party titles it was released on the DS to boost the handhelds sales. Unfortunately the online servers were shutdown in 2015. 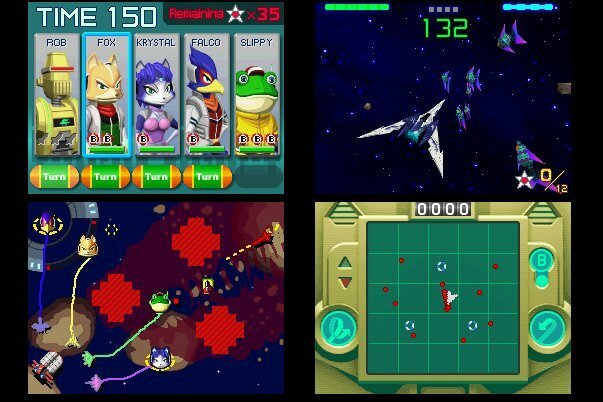 Starfox Command takes place a few years after Starfox Assault and features six different endings based on how you choose to progress through the game. The plot is everyone on the Starfox team has split up and gone their separate ways. Fox is wandering the galaxy doing basically nothing. Falco is a drifter going from job to job. 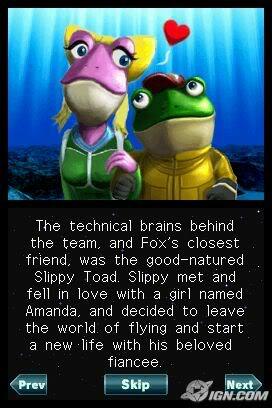 Slippy is engaged to a female frog named Amanda, Peppy is now general of the Cornerian Army and Krystal has joined up with Starwolf after fox told her to leave the team feeling that the life was to dangerous for her. The game introduces a new enemy called the Anglers, giant fish beings that live in the venom sea. Like Andross they too want control of the Lylat system and launch an invasion to get it. As always you take control of Fox and his arwing to do battle against the Anglers. The game takes you too many different planets and sectors and there are a number of different enemies to fight. As you might have guessed players use the touch screen to control the arwing. The controls are very similar to Metroid Prime Hunters, with a few changes. For right handed people L is to shoot and when you hold it down you do a charged attack. The game is mostly controlled using the touch screen, slide the stylus left to go left or slide the stylus right to go right, draw circles on the touch screen to do barrel rolls these can also be changed to inverted controls. Unlike other Starfox titles "cough" Starfox 64 "cough" there are no landmaster missions or voice acting. Characters in the game talk in this annoying gibberish chatter. Thanks to the Nintendo Wi-Fi Connect service shutting down in 2015, all online features in this game have been rendered useless, which does hurt the game's overall score. In the graphics department, Starfox Command look awesome, most likely because at this point in the consoles life people didn't know what the DS was capable of. Even now on the Wii U VC service the game has aged quite well visually and looks every bit as good as Starfox 64! In game play it was interesting what the developers did,the game is a mix of aerial combat and strategy. Let me explain, when you get your mission you don't just jump in and start shooting stuff, you get a map and on the map there are small red dots (in later levels there is fog so you have to clean it away with the stylus first but there is a certain amount you can clean away at one time) these are your enemies. On the same screen there is the great fox and an arwing, basically you just draw a line to the enemy you want to engage. That line you drew is the arwings flight path, but you cant get carried away drawing too many lines because the longer the line means the more fuel you're using and you only have a certain amount per turn so draw your lines carefully. While your objective is to take out enemies and clear a stage your primary objective is to protect The Great Fox. If any enemies get through and destroy the ship the level is lost and will restart. Overall Starfox Command is a great game. The graphics are great, the control are great, the mix of strategy and classic Starfox combat is awesome and suits the game perfectly, the story and its many endings will make you want to play the game over and over again! Unfortunately for some people getting the controls down can be a pain they take some getting used to. Trying to unlock all the different characters and endings can also be a pain as you have to play through the same levels multiple times. And the removal of the online elements is a real issue as well. Besides all that Starfox Command is a great game and gets a great level of recommendation! Source: You can read @KingreX32's original review of the game here! I tried to spruce this review up abit. The original one was no good.